The arch of the foot is a fascinating structure. The arch is like a bow without an arrow, and its curved shape is created by a “string” of muscles and elastic connective tissues. Every time you take a step, your weight pushes down on the arch. It doesn’t collapse because of an artful combination of bone shape, springy ligaments, long “stirrupt” tendons from leg muscles … and the arch muscles. The arch muscles of the foot itself don’t actually “kick in” until you reach quite heavy loads: about 181 kilograms. Although that sounds like quite a lot, loading may spike that high in an average person with every step. We don’t have muscles there for nothing, of course! (The biggest arch supporter is probably the tibialis posterior, deep in the calf. And the tibialis anterior is another one — and it also has a perfect spot for massage, no. 3). Still, the forces on all of these structures are relentless and often very large — no wonder they get exhausted! There is another reason why this spot is significant. The skin of the feet has a disproportionate number of nerve endings, like the face and the hands, yet the feet are generally abused or at least neglected. Therefore the sensations of foot massage seem particularly rich and diverse in contrast to the usual stomp, stomp, stomp of their daily stimulus. This model shows what a man’s body would look like if each part grew in proportion to the area the cortex of the brain concerned with sensory perception hands and lips dominate — but the feet are also disproportionately large, indicating their sensory importance. How do you find muscle knots in the arch of the foot? Not only is this probably the most perfect of all Perfect Spots, but it is also perfectly easy to find: it is exactly in the center of the bottom of the foot, halfway between the heel and the ball, and halfway between the inside and outside edges (perhaps slightly closer to the inside). The arch muscles generally feel best when pressed on an angle, for example towards the outside of the foot. But this is a minor point: any angle will do! What does massaging the arch of the foot feel like? You will know it when you feel it! Having massaged thousands of people and thousands of feet, I can tell you without hesitation that the center of the arch muscles is a popular, “feel good” spot. It usually produces a clear, sweet ache with mild to moderate thumb pressure only. Note that despite its popularity, Perfect Spot No. 10 usually does not cause any referred sensation — that’s the satisfying, spreading ache that is often associated with other significant trigger points. Don't take the lack of referred sensation to mean that what you're doing isn't working! All massage feels better when someone else does it, but this is especially true of foot massage. Although it is easy to massage your own foot (and highly recommended if you have no other choice), receiving a foot massage is one of life’s truly delicious experiences, the apple pie à la mode of touch. Some believe that there is yet another reason why foot massage feels so good: there may be neurological and/or energetic connections between each part of the sole of the foot and every other region and system of the body. This is called reflexology. Reflexologists claim that foot massage can have a therapeutic effect on any part of the human body. This claim is extraordinary, and “extraordinary claims require extraordinary evidence” (Carl Sagan, Broca’s Brain, 1972). I have certainly never seen nor heard of such evidence, although (to quote another old chestnut of skepticism) “absence of evidence is not evidence of absence.” The phenomenon may exist, whether there is clear evidence for it or not. However, it is most likely that the profound sensations of foot massage simply gave someone the idea that foot massage was unusually important. I have no trouble with the general idea of therapeutically significant connections between body parts, or even with the particular idea that massaging the foot could affect organs and systems. That is plausible. 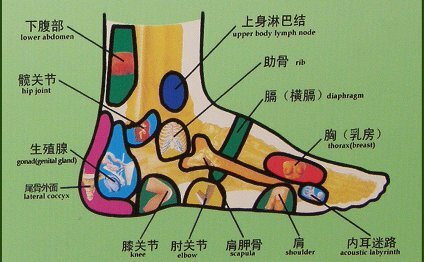 I doubt, however, that the average colourful reflexology “map” is 100% accurate — at least, not compared to the average textbook anatomy diagram. If the connections exist at all, they are probably subtle, and there is probably significant natural variation between individuals. Only a study of a large number of carefully compared observations by several extremely skilled and knowledgeable practitioners could hope to confirm that stimulating a certain tiny spot on the foot has a therapeutic effect on a certain organ — and even then it wouldn’t necessarily be true of every person. My own personal experience with reflexology is that it feels as good as any other foot massage, but no better, and has no apparent additional therapeutic effect. Still, a foot massage is always a pleasant experience in and of itself. Just ordinary good. Trigger point therapy isn’t a miracle cure, but it is a valuable life skill. Practically anyone can benefit at least a little, and many will experience significant relief from stubborn aches and pains. The first several sections are free.